The Khulumani Red Card Campaign has two major components: advocacy and campaigning in South Africa and across the world (as carried out on this blog, for example); and the actual legal battles in the New York courtroom. While we head things up here, we thought it would be a good idea to introduce you to our ‘man on the ground’ in New York, the exceptional lawyer Michael Hausfeld, and his firm Hausfeld LLP. Hausfeld has a long history of work in the field of human rights – on a domestic US-level as well as internationally. He tried the first case that established the principle that sexual harassment was a form of discrimination prohibited under the US Title VII laws. In 1989 he represented the Native Alaskans who were horrifically affected by the Exxon Valdez oil spill, where he negotiated a $176-million settlement from Texaco Inc. He later successfully represented a class of Holocaust victims whose assets were retained by private Swiss banks during and after WWII; and separately represented the Republics of Poland, Czech Republic, Belarus, Ukraine and the Russian Federation on issues of slave and forced labour for both Jewish and non-Jewish victims of Nazi persecution. “The U.S. law under which the [Khulumani] case is proceeding—the Alien Tort Claims Act—provides a place for foreign nationals to bring cases against U.S. citizens or other foreign nationals for violations of customary international law, including gross human rights abuses. The Defendants in the case…have opposed being held to account for their conduct in the U.S. court. When, however, they were given the opportunity in South Africa to tell the truth about their participation in Apartheid and their relationship with its enforcement through terrorist type behavior, they failed to do so. Now they do not want to be held accountable in a court of law in a country in which most of them are citizens or in which they routinely do business. What they are really saying is that they should not be responsible to anyone, for anything, at anytime, anywhere. Many Khulumani members are much older now, but they’re not stronger –many are quite frail – and they’re not experiencing a waving flag of freedom, but ongoing poverty. 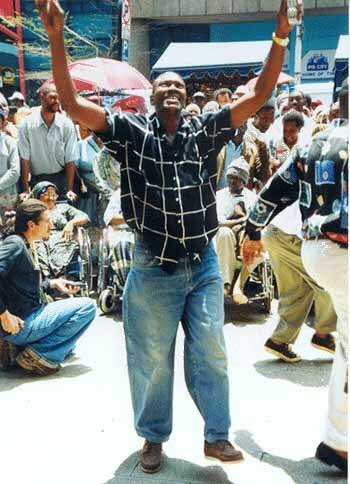 K’maan’s reflection on the broken promises made to his generation could well be sung about the promises made to Khulumani members – they or their families were part of the freedom struggle against apartheid. Promises were made about reparations and that perpetrators who had not received amnesty would be prosecuted. The reparations were not adequate and not what the TRC recommended. Government broke that promise. Government has taken so long to start prosecutions against the perpetrators, that many of these crimes have now “expired”. Only murder does not expire as a crime. Another broken promise of Government. The National Prosecuting Authority (NPA) should have initiated these prosecutions in consultation with the victims of the crimes immediately after the closure of the Truth and Reconciliation Commission (TRC). They did not, and now they may have delayed too long. When K’naan sings that “i heard them say love is the way/love is the answer that’s what they say”, in South Africa what they said was “the TRC is the answer”. But many people couldn’t access the TRC, and those that did, have been profoundly let down – not in the least by it’s inability to ensure government followed up and secured adequate justice, tangible reparations and corporate accountability. For most Khulumani members, those who went to the TRC and those who didn’t, the waving flag of freedom hasn’t “opened happiness” (as Coca Cola may have you believe) but has been only a small victory in the ongoing, everyday struggles for justice. Aluta continua!